This new machine has been specifically designed with the needs of the poultry sector in mind. The Combi-RT offers wide ranging benefits for producers and operators as well as reducing the stress levels and bio security risk for enhanced welfare of broilers. Fitted with a clear view 3 stage mast with full free lift, the RT’s low profile allows it to work both outside and inside the poultry house. 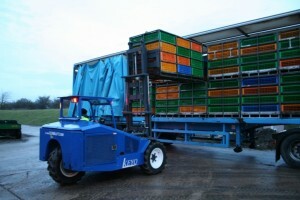 Having picked the empty modules from the trailer the operator can then lower the mast without any loss of speed to take them directly to the waiting catchers, with no danger of the module collecting litter on its base as it travels through the poultry house. The large diameter tractor grip tyres, all wheel traction with differential lock and 300mm (12”) ground clearance enable the machine to operate smoothly in all manner of litter conditions, contributing to reduced disturbance of litter which is also advantageous when thinning.